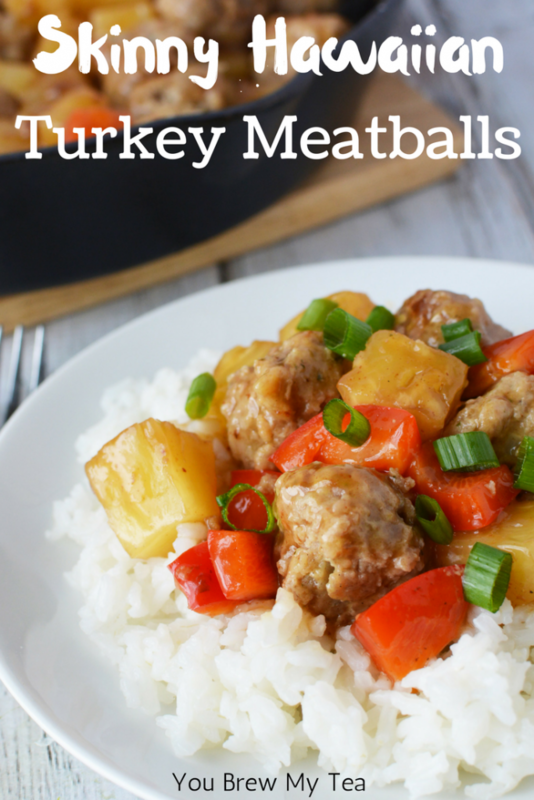 We love having meatballs as a great easy meal option. 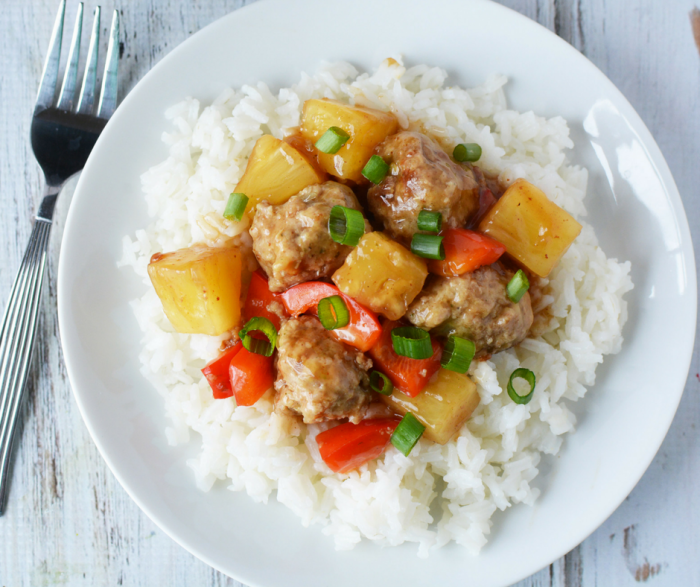 This healthy Skinny Hawaiian Meatballs Recipe is a perfect option that takes the otherwise bland ground turkey and makes it full of flavor. This is a huge hit with the kids, and is going to become a family favorite for sure! My friend Kari from Craft Create Cook whipped these up for us recently, and we just love them! This post includes affiliate links. I earn a small commission on purchases made via these links. Weight Watchers rolled out their FreeStyle update in December 2017, and along with fruits and vegetables, ground turkey breast was included in zero point foods. You have to make sure it is 98% fat-free and turkey breast meat only (no dark meat). Since ground turkey breast can be a bit bland at times, this is a great way to add some flavor without a ton of calories. 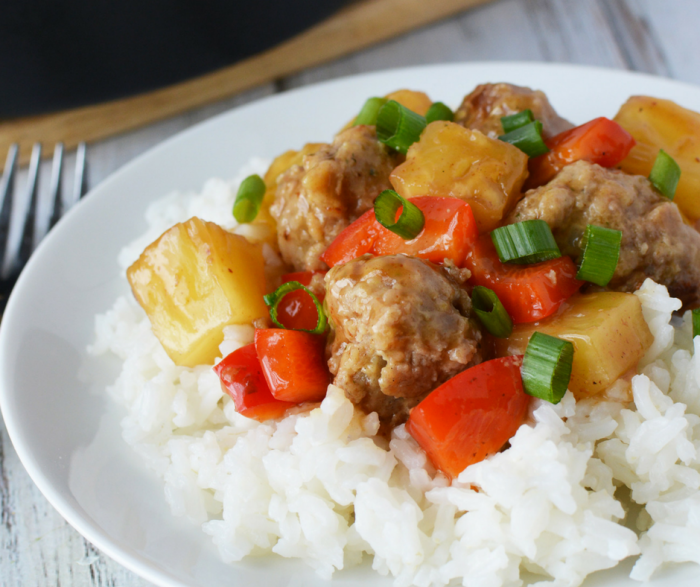 Plus, kids will love the sweet and sour option on the menu! Place 1/2 cup chicken broth into a large nonstick skillet and set aside. In a large bowl, add turkey, breadcrumbs, onion, salt, and pepper and mix well. Add in the egg and mix well until all ingredients are incorporated. 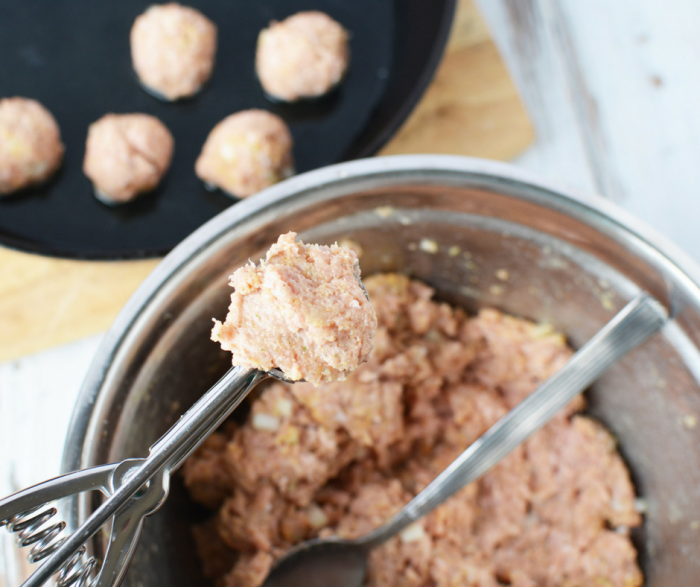 Use a tablespoon scoop to shape meat into meatballs. Place meatballs into prepared pan. Heat pan over medium-high heat to cook meatballs for 3-4 minutes on each side. When cooked through, remove from pan and set aside. 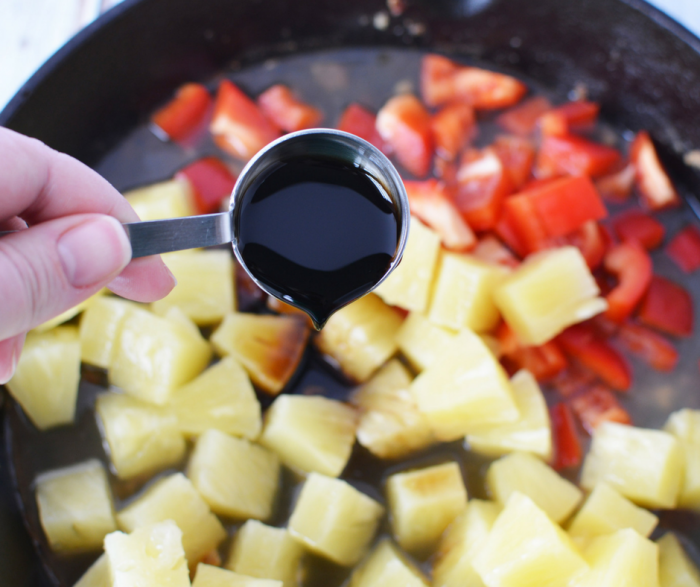 Add red pepper, pineapple, soy sauce, brown sugar and vinegar to skillet. Heat over medium-high heat until bubbly. Stir in cornstarch mixture and cook for 1-2 minutes until sauce begins to thicken. Add meatballs back into pan and heat for 3-5 minutes or until meatballs are heated through. Serve over a bed of rice, riced cauliflower, or pasta as desired and garnish with green onions. Place ½ cup chicken broth into a large skillet and set aside. 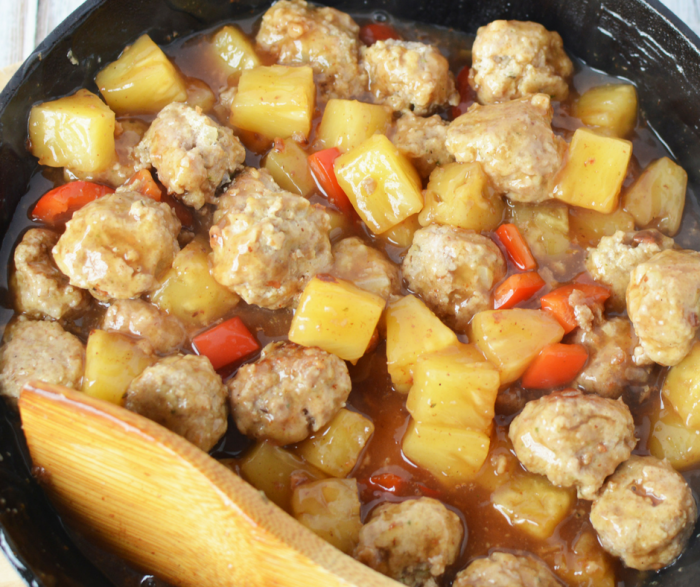 Add red pepper, pineapple, soy sauce, brown sugar and vinegar to skillet. Heat over medium-high heat until bubbly. Stir in cornstarch mixture and cook for 1-2 minutes until sauce begins to thicken. Add meatballs back into pan and heat for 3-5 minutes or until meatballs are heated through. 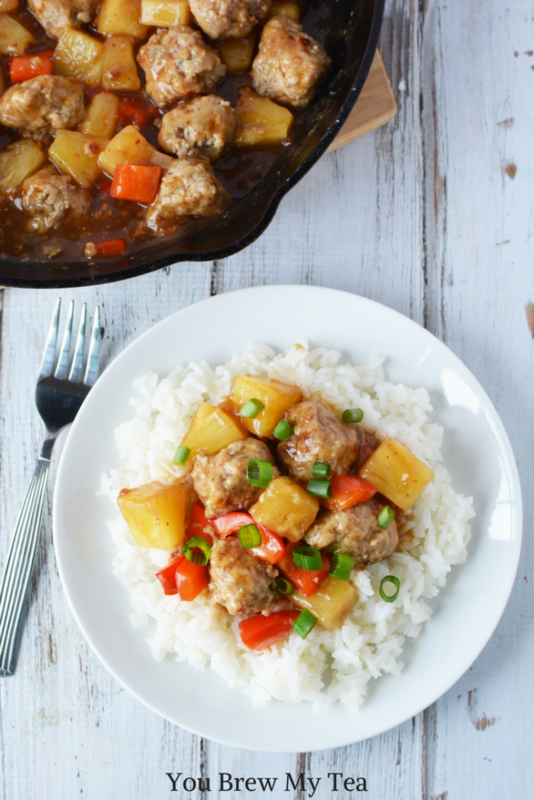 This recipe for skinny Hawaiian meatballs is going to become a family favorite! The best part? It is super easy to prep ahead and freezer for easy future meals! You can cook as directed then put into freezer containers to reheat easily, or you can even simply prep the meatballs ahead of time and add a baggie with the sauce mixture separately for an easy to thaw and prepare meal. Loved this! Only one question: should I count the juice from the canned pineapple? It is included in the recipe calculations.